When you work on enough cars and bikes, you start to learn little tricks. I've learned a few more with the Z, so here are a few of my favorites. A couple of the fuel tank vent hoses are molded to specific shapes. If you try to use an ordinary hose it'll kink and close. 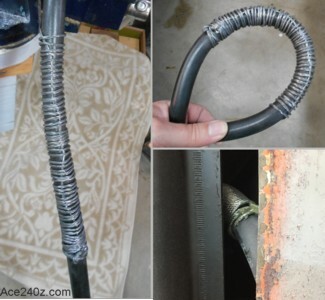 Some people put a long spring inside the hose to keep if from collapsing. I couldn't find a spring that would fit, so I wound about 5' of woven cable on the outside. It's about 1/8" diameter and you can get it at your local home improvement store. The sharp ends were covered with a few blobs of epoxy. The result is a hose that won't kink. Look at how far I was able to bend it. A bonus is the protection. One of the hoses is slightly underneath the body and right next to the tank. With the cable wrapping there's no chance of the hose chafing or splitting. The pair of stock molded hoses was about $100. Using bulk hose and cable was about $20. I didn't invent this method, but it's certainly worth passing along. When these cars were being built, they applied some sort of thick, rubbery insulation on the floors and transmission tunnel. Over the years it becomes rock-hard. Removing it is nasty, ugly work, typically using a heat gun and a putty knife and a lot of toil. Warning: Make sure you have very good ventilation while doing this, and remember that contact with dry ice will burn your skin. Buy a block of dry ice and a large bottle of rubbing alcohol. Break the ice into small chunks and dump them into a bucket. Pour the rubbing alcohol over the chunks of dry ice and stir until it forms a thick slush. Poor that slush directly on top of the insulation. Within 15-20 seconds you'll hear cracking sounds. The slush is so cold that the insulation freezes and turns brittle, and in the process it shrinks so quickly that it breaks itself into pieces and pops right off the steel floor. Bang on the insulation with a hammer to break it up even further. A putty knife can easily scrape up the little remaining pieces. The dry ice and rubbing alcohol will evaporate, leaving clean metal behind. It takes about 10 minutes on each side. The sides of the transmission tunnel are a little tougher. Use the same kind of slush but pour it into a plastic bag, drape it against the side, wait 2-3 minutes and then you can break apart the insulation, but only in that area. It's slow but still better than a heat gun. Here's gift from the previous owner: a broken-off bolt for the differential mount. 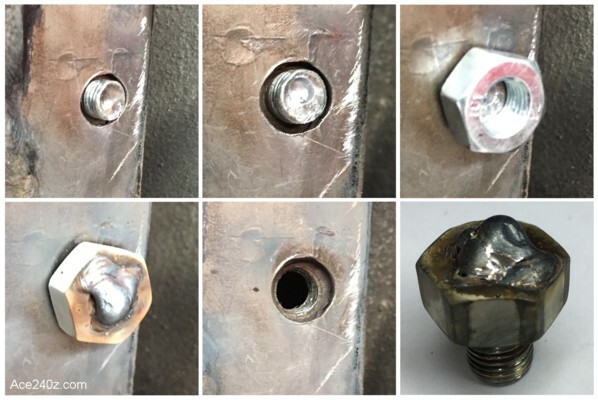 A few threads were exposed, so I drilled a hole about 1/8" deep and managed to wedge a nut over the threads, then hit it with my welder, starting inside the hole and slowly backing out. I let it cool off, gave a few careful tugs, and out it came. Bonus was gaining a new marker for the next time I play Monopoly.